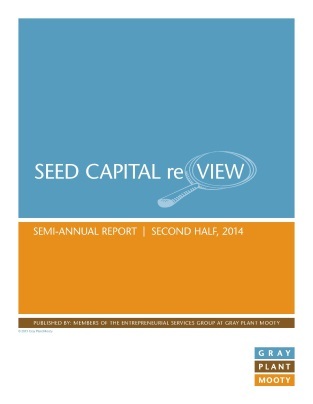 entreVIEW: Seed Capital reVIEW—It’s Survey Time (again)! Seed Capital reVIEW—It’s Survey Time (again)! Having our Seed Capital reVIEW report for the second half of 2014 (which analyzes seed and angel capital raised by early-stage companies in Minnesota) in the rear view mirror can only mean one thing—it’s time for us to start collecting data on deals completed during the first half of this year. As you may recall, Seed Capital reVIEW is our compilation of data regarding what types of companies are raising early-stage capital in Minnesota (typically between $100,000 and $2,000,000) and the terms relating to that fundraising activity. I know, it isn’t quite as fun as taking a survey to find out which character from the movie Inside Out you are (easily the best movie of the summer, if you ask me). For the record: according to the survey, I’m Joy and I’m living with Anger and Disgust. (including equity crowdfunding, which is almost legal in Minnesota). Of course, the key to making the data meaningful is to have broad-based participation to ensure the data provides an accurate reflection of seed capital activity. With that in mind, please CLICK HERE NOW to help us out. Please also send this link to others who you know were involved in seed and angel capital raising in the first half of the year. As added incentive to respond to our survey, the Gray Plant Mooty Foundation has pledged to make a $10 donation to MEDA, the Minnesota Economic Development Association, for each survey completed. MEDA is an organization that provides business development services, business financing, and access to market opportunities to support entrepreneurs of color. Thanks for helping us collect some data of interest to entrepreneurs and investors.